When you think of Mardi Gras Masks you usually think of satin eye masks, feather masks, sequin and glitter masks, as well as venetian style paper mache masks. All those festive masks are great for decoration, gifts or simply to wear, but they don't hold a Cajuns Candle to our Woman's Mardi Gras Neoprene Face Mask. The 2013 Woman's Mardi Gras Biker Face Mask is made from 100% neoprene so it can withstand 200mph winds. Have you ever seen a paper mache mask on a motorcycle? They don't last long. 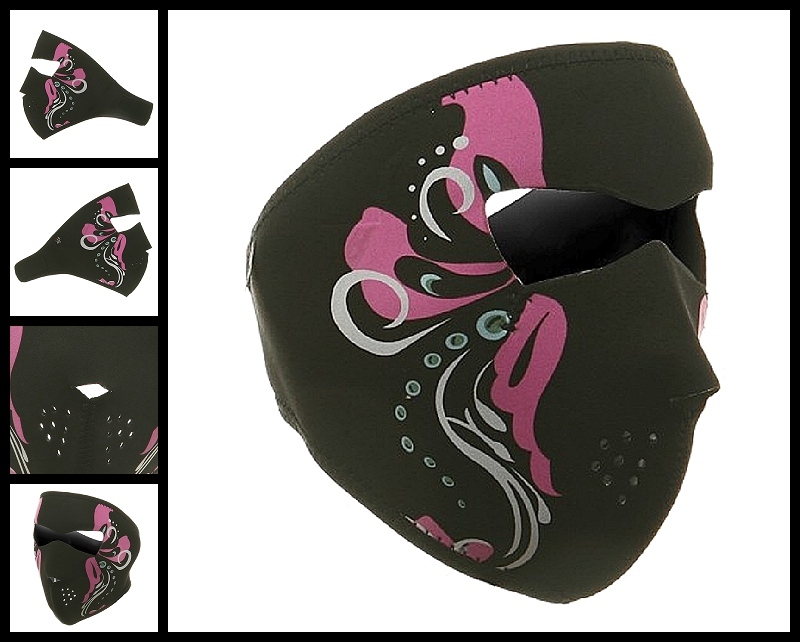 Our Woman's Mardi Gras Neoprene Face Mask is also warm and water resistant. Those strengths come in really handy in the Big Easy since it always rains during those parades. I promise you this, you will be the talk of the ball in our Woman's Mardi Gras Neoprene Face Mask. Mardi Gras Biker Neoprene facemasks feature full coverage of the face and ears. The neoprene material is warm and water resistant. Mardi Gras Biker patterns are reversible to solid black material. Velcro closure ensures great fit with goggles, with a helmet or without. One size fits most.